Last winter, I was up in Minnesota visiting a couple of schools I work with. 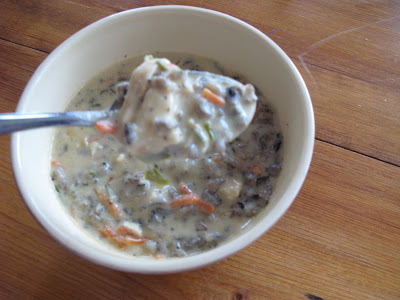 While there, I had a chance to eat at the original Famous Dave's restaurant and had his yummy wild rice soup. I even took pictures of the inside of the restaurant--I know I did! But I think they are filed in some strange way and I can't locate them. A blog for another day. But back to the soup. This was a first for me and oh, it was a great stick-to-your-ribs soup. And I wondered, could I replicate it? 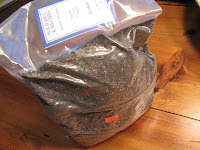 On the way back to the airport we saw several signs for places selling wild rice so we stopped and I bought 5 lbs worth. Guess what, that 5 pounds sat on my pantry shelf for months--until yesterday. Fortunately, there was a small recipe booklet that came with the rice that gave me some pointers on how to cook the rice. I searched the Internet for some wild rice soup recipes and ended up improvising on my own with ingredients I had on hand. I first had to cook the rice, which takes a little longer than regular rice. I read where it's good to cook up a bunch at one time and that it will keep on hand nicely in the refrigerator for a week or more. It freezes well, too, they say. So I cooked a bunch. Add salt to the water and boil. When boiling, add the rice and stir. Bring back to a boil. Cover and reduce heat to a simmer for about 1 hour. When rice has burst open and most of the water is absorbed, fluff with a fork. Cook for a little longer if necessary. 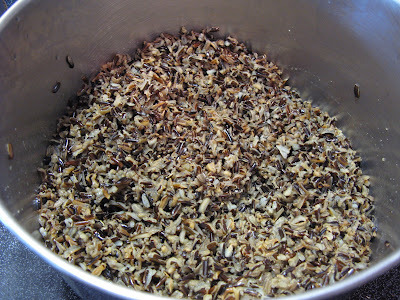 When done, drain any remaining water from the rice. This is how I made the soup. I used what ingredients I had on hand and honestly, I didn't measure so I'm estimating in some cases. It was a cold and blustery day and I had no desire to run to the store, so this is totally a what-was-on-hand kind of soup. I thawed the frozen chicken stock in the soup pot and added the water and brought to a boil. The carrots went in next to cook but since they were shredded it didn't take long. If I had onions or celery at home, I would have added some at this point, too. I added fresh rosemary, dried time, frozen chives, salt and pepper. While simmering, I shredded the chicken. When carrots were soft, I made a paste with the flour and water and added to the broth to thicken and cooked for a few minutes. The milk, butter, and cheese followed. 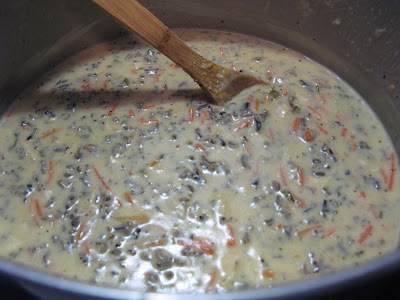 When the cheese and butter melted, I added the cooked chicken and about 3 cups of the cooked wild rice. The rest, as they say, is history. It was VERY good. I had to freeze part of it to keep me from eating it all in one day! I will play with this recipe but I was happy with the results. 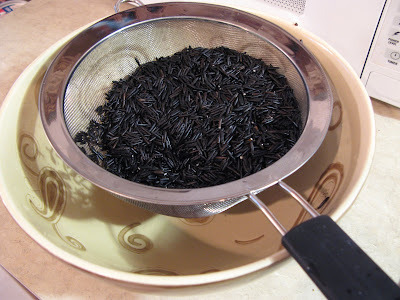 And, I had three 1 1/2 cup containers of wild rice left to put in the fridge, so I'll be experimenting with other dishes this week, I'm sure. What do you think? A keeper? Sounds yummy, Maddie. I think the soup recipe is a keeper. :) I could eat some about now, and the pics came out wonderful.